Samsung Group’s heir apparent Lee Jae-yong was arrested with physical detention early Friday morning on charges that include bribery to President Park Geun-hye and her friend Choi Soon-sil. The arrest of Samsung Electronics vice chairman came shortly after a court issued a warrant in the second attempt by the special counsel to arrest him. “It is acknowledged that there is a need and reason for the arrest, given a newly added criminal charges and additional evidence," the Seoul Central District Court said. The same court last month rejected the counsel team’s earlier request, citing lack of evidence. Upon the ruling, the special counsel looking into the scandal involving President Park and her close confidante Choi immediately placed Lee behind bars at a detention facility in Uiwang, southwest of Seoul, where he had been awaiting the court's decision. Lee, the 48-year-old Samsung Electronics vice chairman, is charged with bribery, embezzlement, perjury, concealment of criminal proceeds and illicit transfer of assets abroad. 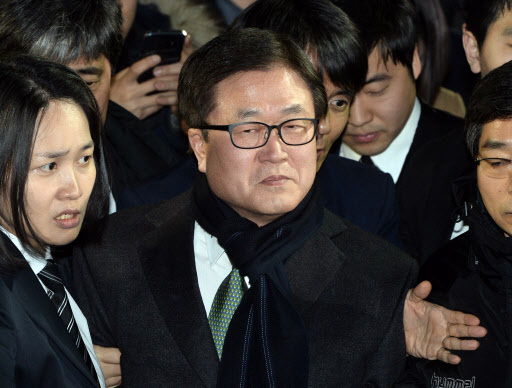 The court, however, rejected an arrest warrant for Samsung Electronics President Park Sang-jin. Park was allegedly the key party in facilitating support for Choi. "Given the suspect's status, authority and the actual role he played, it is difficult to recognize the necessity and reason for the arrest," the court said. Lee is suspected of offering bribes worth 43 billion won ($36 million) to Choi in return for the Park administration’s backing of a merger of two Samsung affiliates. The merger was a crucial step for the ailing chairman Lee Kun-hee’s power transfer to his only son Jae-yong. The team also suspects the Fair Trade Commission and the Financial Services Commission of pushing for policies in Samsung Group’s favor to help its founding family tighten its grip on its affiliates and smoothly transfer power. Looking tense and grim-faced, Lee left the courtroom at around 7 p.m. on Thursday after the hearing that lasted more than seven hours, taking an unusually long time for a warrant review hearing. Lee has denied all charges, saying he was forced to make donations to entities controlled by Choi, including the K-Sports and Mir foundations, and did not seek any business favors in return. Samsung Group said Friday in a brief statement that it will do its best to ensure that the truth is revealed in future court proceedings. The arrest of the Samsung executive is a severe blow to global electronics giant Samsung Electronics, which has suffered from a leadership vacuum in recent weeks due to the de facto leader’s involvement in the alleged bribery. President Park will also likely take a hit, as the alleged Samsung bribery is a key charge under review at her impeachment trial at the Constitutional Court. Lee is the first high-ranking businessman to be arrested over the scandal. Several other Korean conglomerates also made donations to Choi’s foundations, although the investigation has not extended to them yet.